The purpose of Book Club is to encourage the reading and discussion of a variety of books. 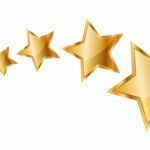 After Book Club members provide recommendations for and complete the selection of books, the books are ordered and delivered through the library. Thus, students are not required to purchase books. At the meetings, which are held once a month during designated study hall periods, refreshments are often served and the discussions become quite lively! All Mater Dei students are welcome to join Book Club at any time throughout the year. National Honor Society (NHS) promotes scholarship, leadership, service, and character. Scholarship – Members must possess and then maintain a cumulative minimum grade point average of 3.6 (4.0 scale). 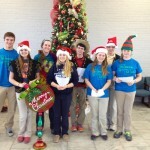 Service – Members perform voluntary work in the school or in the community each semester. Leadership – Members demonstrate leadership skills in the school or in the community while working with or for others. Character – Members uphold the principles of morality, integrity, and honesty; and demonstrate reliability, cooperation, and respect. Membership: Members are inducted in May of their sophomore, junior, or senior year. Activities: Members are involved in a number of voluntary activities throughout the year both in the school and in the community. Annually at Mater Dei, in conjunction with our St. Vincent De Paul Society and class officers, NHS sponsors a Thanksgiving Food Drive. The collected canned goods are distributed to local organizations that provide food for those in need. 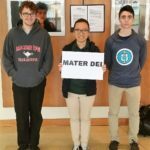 Scholar Bowl is an IHSA sanctioned activity for which all Mater Dei students are eligible. The Scholar Knights compete at the varsity, junior varsity, and freshman levels. A scholar bowl match consists of head-to-head competition between teams who answer questions relating to various topics including English, history, mathematics, and science. The fall season culminates with the South Central Scholastic Conference Tournament, while the spring season culminates with IHSA playoffs. 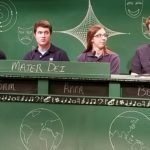 At Mater Dei, a student may join Scholar Bowl at any time during the season. While many students elect to play all year, other students elect to play during the off-season of the other activities in which they participate. During the season, the team practices on Wednesdays from 3:00 pm to 4:00 pm. 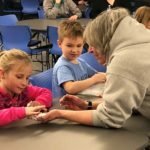 Each year, members plan and host a Summer Science Camp for students enrolled in local grade schools. In preparation for the Summer Science Camp, members are able to explore their particular area of interest in science, such as experimentation, engineering design, electricity, and rocketry. Throughout the year, members also travel to various sites of interest as determined by the membership, such as Meramec Caverns, the St. Louis Science Center, and the St. Louis Zoo. All Mater Dei students are welcome to join Science Club, which meets during designated study hall periods. The purpose of Spanish Club is to promote a greater immersion in the culture of people in Spanish speaking countries. Thus, during meetings, which are held during designated study hall periods, members enjoy a lively environment in which food from Spanish-speaking countries is tasted and games are played. Moreover, when an opportunity arises to experience those cultures firsthand, the club members are encouraged to attend. Finally, the club has two parties a year to celebrate Christmas and Cinco de Mayo. All Mater Dei students are welcome to join Spanish Club at any time throughout the year. 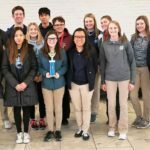 The WYSE (Worldwide Youth in Science and Engineering) team participates in the Academic Challenge at Kaskaskia College in early February. The team consists of 14 varsity members and 14 junior varsity members. Students prepare by taking practice tests, which they obtain from the WYSE page on Edline, and reporting their scores to the moderator. Team members are then selected by their test scores. 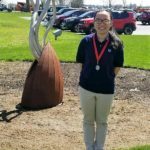 The Academic Challenge is a competitive series of tests created and administered by WYSE and offered to high school students in Illinois and Missouri. Test material is drawn from senior level high school curricula and freshman level college curricula. Written by teams of college and university faculty, subjects include biology, chemistry, computer science, engineering graphics, English, mathematics, and physics. 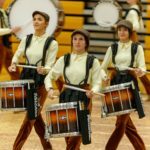 Students can advance both individually and as a team to the sectional and state competitions, which are held in March and April respectively. The yearbook, The Knight, is a student-managed publication. The staff members are responsible for taking pictures, designing layouts, and writing articles and captions. The staff holds meetings on Tuesdays and Thursdays from 3:00 pm to 4:30 pm (staff members are asked to attend as often as possible). In addition, because students complete the pages online, they are able to work both at school and at home. 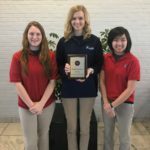 The Knight has continually received awards at the annual Southern Illinois School Press Association (SISPA) Convention, including receiving the prestigious “Golden Dozen” award in 2011, recognizing the 2009 – 2010 yearbook as one of the twelve best at the convention. All Mater Dei students are welcome to join the staff of The Knight at any time throughout the year. The newspaper, The Mater Dei Lance, is a student-managed publication. 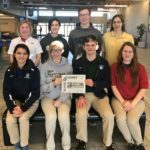 The staff welcomes students interested in writing and reporting news or creating artwork for the newspaper, which is published five times during the school year. One planning meeting and one week of layouts are held for each of the five editions. 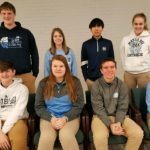 The Mater Dei Lance, which possesses nearly 350 subscribers, has continually received high ratings at the annual Southern Illinois School Press Association (SISPA) Convention, including being awarded the prestigious “Blue Banner” award in 2005 and 2011 for overall excellence. All Mater Dei students are welcome to join the staff of The Mater Dei Lance at any time throughout the year. 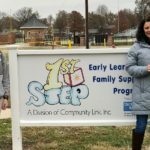 Big Brothers Big Sisters has helped kids reach their full potential in the Clinton County community since 2000. 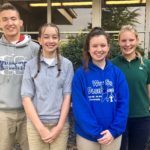 Mater Dei Catholic High School students have the opportunity to serve as a volunteer and friend to a child at an elementary school in Aviston, Beckemeyer, Breese or Germantown. To be eligible to serve as a volunteer, students must be a junior or senior. In addition, students must commit to visiting their “little” one hour per week during the school year (visits occur during designated study hall periods). Finally, because all visits take place at the elementary schools, volunteers are required to provide their own transportation to and from the elementary school and Mater Dei Catholic High School. The mission statement of Mater Dei stresses the importance of a caring environment, respectful of individual differences. The Peer Assistants program seeks to ensure that the atmosphere at Mater Dei is always pleasant and non-threatening for all students, meaning that all students feel comfortable and welcome. Peer Assistants are trained to reach out to students who may be having difficulty adjusting to the demands of high school or who find it difficult to identify with other students. There is a special awareness of those students who do not have a large number of grade school classmates attending Mater Dei. Peer Assistants are also trained to assist with conflict resolution in case the need arises and to provide support for those dealing with other concerns. Currently, faculty and parents make referrals to Campus Ministry and the Student Assistance Program. These referrals often deal with family issues, relationships or personal concerns. Sophomore, junior and senior students interested in serving as a Peer Assistant may request an application from Mr. Darr. 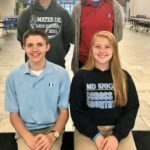 Student Ambassadors play a vital role in promoting Mater Dei to prospective students and their parents, current students and their parents, and alumni. 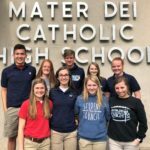 In their role as ambassadors, students share not only their knowledge of Mater Dei, but also their “spirit” for Mater Dei. In the spring, freshman, sophomore, and junior students apply to serve as Student Ambassadors for the following school year. Applicants must request references from two teachers, possess a “C” average, and display the “spirit” of Mater Dei. Selected students are then trained during the summer. Student Council represents the student body in bringing forth ideas, projects and school improvements that enhance the mission of Mater Dei. Members are elected by their peers and serve as positive role models for their fellow students. 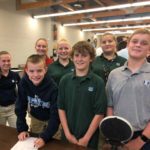 While participating in Student Council, representatives learn parliamentary procedure, leadership responsibilities, and decision making skills. They also learn to serve as a voice for their fellow students and to initiate change for the betterment of the school. 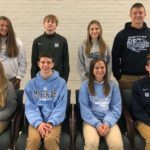 Serving on Student Council allows members to use their time and talents to represent Mater Dei, its mission and its students, while gaining valuable leadership experience. 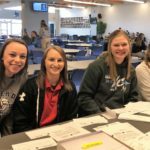 Student Council members are responsible for planning and executing homecoming activities, sponsoring basketball concessions, and working in conjunction with the Red Cross to host two annual blood drives. They also organize and contribute to various fund raising activities on a local and national level. 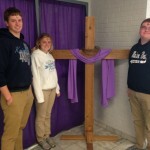 Finally, Student Council provides financial support for various school projects, which include purchasing patio tables, benches, cafeteria improvements, sinks for the rest rooms, an outdoor nativity set and a stage curtain. The Student Council membership is as follows: ten seniors (six homeroom and four at-large representatives), nine juniors (six homeroom and three at-large representatives), eight sophomores (six homeroom and two at-large representatives), and six freshmen (homeroom representatives). Elections for senior, junior, and sophomore homeroom and at-large representatives are held in the Spring for the following school year. Freshman representatives are held after the first quarter of the new school year. All students with a qualifying grade point average are encouraged to run for Student Council. 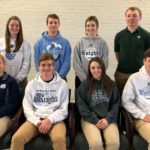 Student Council members are expected to attend meetings during the scheduled study halls, help decorate during the weekend before major events, and work at the concession stand at home boys basketball games on Friday and Saturday nights. In addition, the Marching Knights perform at half-time of home varsity football games. November 2 and 3 at 7:00 p.m., November 4 at 2:00 p.m.
March 29 and 30 at 7:00 p.m., March 31 at 2:00 p.m.
All Mater Dei students interested in the performing arts are encouraged to participate in the fall play and spring musical. 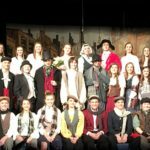 The fall play performance weekend occurs in late October or early November. 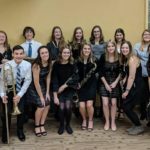 The spring musical performance weekend occurs in late March or early April. Staging a theatrical production requires a variety of both on-stage and off-stage commitment. Thus, students possess a wide variety of opportunities to participate with the play and the musical. Performers As on-stage performers, students will both utilize and further develop their acting ability. Roles vary in size and number, depending on the selected play or musical. The musical usually includes a chorus of singers and/or dancers; as a result, students who audition are not normally cut from the musical. Auditions, which are announced at school, occur six to eight weeks prior to the performance. Rehearsals take place after school and/or in the evenings. Musicians (Musical Only) As members of the pit orchestra, students will both utilize and further develop their musical ability. Instruments vary in type and number depending on the selected musical. Rehearsals take place after school and/or in the evenings, usually beginning four to five weeks prior to the performance. Students interested in serving as a member of the pit orchestra should contact the director or the music director. Lighting and Sound Technicians As members of the tech crew, students will both utilize and further develop theatrical lighting skills and/or theatrical sound skills. 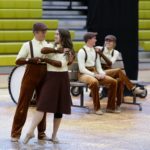 The two weeks prior to a performance are usually reserved as “tech weeks.” Students interested in serving as a member of the tech crew should contact the director. Stage Manager and/or Student Director As a stage manager, a student who exhibits exceptional leadership and organizational qualities will possess the opportunity to utilize these skills in order to ensure a smooth-running performance. Specifically, the stage manager is in charge of all props, scene changes, and curtain opening/closing. Occasionally, a director will also select an additional student to serve as a student director. Both the stage manager and student director are required to attend rehearsals and performances. Students interested in serving as a stage manager or student director should contact the director. Stage Crew As members of the stage crew, students are responsible for scene changes or movement of sets that are required during the performances. Students interested in serving as a member of the stage crew should contact the director for a schedule of rehearsals they are required to attend. Ushers As ushers, students will not only welcome and provide programs to patrons, but also assist them in finding their seats. Ushers are required to arrive one hour prior to the performances and remain one hour after the performance to assist in cleaning and preparing the gym for the next performance. Students interested in serving as an usher should contact the director. Box Office As a member of the box office staff, students who possess strong organizational skills sell performance tickets at school during lunch periods two weeks prior to the performances, as well as in the box office during the performances. Students interested in serving as a member of the box office staff should contact the director. FBLA started in the 1969 - 1970 school year and has continually possessed a strong tradition. The FBLA members are students, grades 9 - 12, who are interested in a business career. The frequency of meetings, which are held during designated study hall periods, varies depending on the event members are planning. Members must pay national FBLA dues, which are $15. 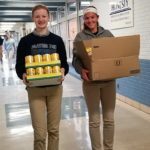 Buzz Book Sales – The sale of the Buzz Book is a fundraiser from which both the FBLA and the Mater Dei student body benefit. Specifically, FBLA members create a phone book which includes the names, birthdays, telephone numbers, addresses, and parents' names for each student; as well as the names, birthdays, telephone numbers, and addresses of the administration, faculty and staff. Students may then purchase the Buzz Book. Candy Cane Sales - The sale of candy canes is a fundraiser from which both the FBLA and the Mater Dei student body benefit. 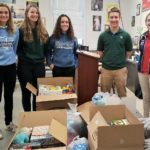 For two weeks in December, FBLA members receive orders, during the lunch periods, for candy canes, which are then delivered to the recipient the next week. This project is very popular! 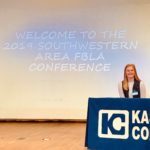 Official FBLA Conferences - FBLA members possess the opportunity to attend the Southwestern Area Leaderhip Conference, the Illinois State Leadership Conference and the National Leadership Conference. 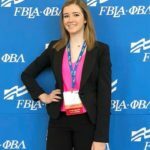 At these conferences, members both compete in business related competitions and learn business skills that will aid them in their future business careers. 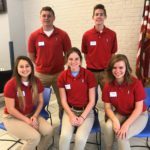 Field Trips - FBLA members possess the opportunity to attend field trips to businesses in the St. Louis area in order to provide members with the opportunity to learn the various aspects of successful businesses. 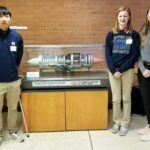 Previously, members have visited AG Edwards, Anheuser Busch, Price Waterhouse Coopers, Build-A-Bear Workshop, The Maschhoffs, Inc., Southwest Airlines, and The Fox Theater. Through their involvement in Model United Nations (Model UN), students will both utilize and further develop their knowledge of current events, international relations, diplomacy and the United Nations. Specifically, students “serve” as diplomats, representing a nation or non-governmental organization, in a simulated session of a United Nation’ committee, such as the Security Council or the General Assembly. Thus, students have the opportunity to research a country; investigate international issues; and develop solutions to world problems after engaging in debate, deliberation, and consultation. The Model UN team attends conferences/competitions at Blackburn College and McKendree University. Prior to these events, meetings are held as needed during study hall periods. All Mater Dei students are welcome to join Model UN at any time throughout the year. The purpose of the bass fishing team is to utilize and to further develop the skills of students interested in competitive sport fishing. Additionally, students develop an awareness of the benefits of outdoor recreation and the importance of preserving our natural resources. Weather permitting in the spring, one or two practices are held each week after school. 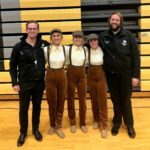 The team then participates in the IHSA regional competition, from which the top three teams advance to the IHSA state competition. Students are responsible for providing their own equipment (fishing gear and life jacket). All Mater Dei students are welcome to join the bass fishing team in the spring. The purpose of Chess Club is to develop both the understanding of and the enjoyment of the game of chess. Thus, all students, regardless of skill level, may participate in Chess Club, which meets in the library during designated study hall periods. Moreover, chess sets are provided at no charge. All Mater Dei students are welcome to join Chess Club at any time throughout the year. 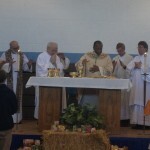 Liturgical Planning Team provides all students with the opportunity to utilize their gifts and talents to make each all-school Mass “their own” by planning and actively participating in the Mass. Membership All students are invited to join the Liturgical Planning Team, which they may do by signing the “Volunteers for Masses” sheet, which is provided in Religion classes at the end of the school year; or by contacting moderator Mrs. Judy Kampwerth, who provides students with a pass to attend the planning sessions, which are held during study halls (planning session dates are announced at school). Environment Group - members design a plan to creatively “transform” the gym into a sacred place of prayer according to the liturgical season or theme of the Mass, arrive before school to set-up the gym, and remain after Mass to clean the gym. Word Group - members select the readings (when applicable), select student lectors, and create the petitions. Music Group - members select the music according to the liturgical season or theme of the Mass and assist in obtaining the selected music. Actions Group - members prepare the PowerPoint presentation and programs for the Mass, serve as sacristans, and serve as greeters. In addition, members determine if liturgically appropriate actions, such as liturgical dance, will be utilized to enhance the Mass. 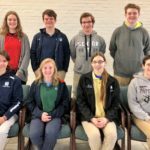 Ministers of Hospitality Group - members select students to serve at the Mass as greeters; Eucharistic Ministers; ushers; and cross, candle, and gift bearers. The Liturgical Music Group (LMG) is a dedicated and talented group of musicians who plan and lead the liturgy music at all-school Masses. 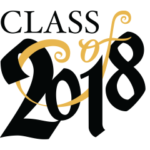 In addition, LMG has provided music for Masses held for the Mothers and Friends organization, for our Graduation Masses, and for special events held for the Mater Dei community. 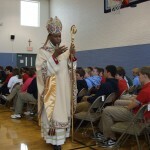 On the day of an all-school Mass, LMG practices during first period and second period. All Mater Dei students are welcome to join LMG at any time throughout the year. The Warren G. Murray Developmental Center, located in Centralia, Illinois, is a home for the developmentally disabled. Students from Mater Dei have a long standing tradition of visiting Murray Center one Saturday each month during the school year. All Mater Dei students are invited to participate with the Murray Center residents in activities which include, but are not limited to, coloring, dancing, making crafts, playing basketball or softball, playing board games, and going for walks. Students may sign up in their religion classes to attend Murray Center visits. We always look forward to another great year of visits to the Murray Center! As members of St. Vincent de Paul Society, our students, in a spirit of justice and charity, help those who are most in need. 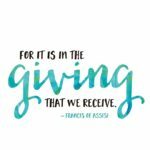 No work of charity is foreign to the society, for its ministry, through person-to-person contact, encompasses every form of aid that alleviates suffering and promotes the dignity and integrity of humankind. Membership All students are invited to join St.Vincent de Paul Society! Meetings, which are held during designated study hall periods, are announced at school. Students may contact Mrs. KK Schneider to receive a pass to attend the meetings. Prayer - Members invite students and faculty to join them in the chapel for prayer services, which are held on Friday mornings from 7:50 am to 8:00 am. Communication - Members write “thank you” cards to our priests and parish leaders for their support of our students and liturgical events; and “thinking of you,” “get well,” and holiday greeting cards for the residents of our area nursing homes. 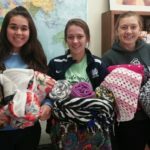 Missions – Members promote, collect the envelopes for, and assist with counting and recording the donations to our weekly mission collections; select the recipients of special mission collections (for individual or group causes); and host bake sales during lunch periods to raise funds for future donations. Warm Hearts Campaign Students, administration, faculty, and staff who donate to this event receive a heart, on which they write their name, to display in the second wing. The funds are then donated to pay the utility bills of a local family in need of assistance. The purpose of Art and Photography Club is to encourage students to utilize and to further develop their artistic abilities. 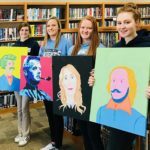 At the meetings, which are held during designated study hall periods, students plan and execute art and photography projects. They then present their projects and explain the skills utilized to create the projects. In addition, students possess opportunities to attend field trips and participate in art displays and contests in the local area. All Mater Dei students are welcome to join Art and Photography Club at any time throughout the year.